CAREER HIGHLIGHTSAfter six years at Volvo's Gothenburg headquarters Petrofski moved to the automaker's operations in Shanghai in 2011. As vehicle line director for China, he helped Volvo become the first premium brand to export China-built cars to the U.S., starting with the S60 Inscription in 2015. That same year he was promoted to senior program director for Volvo's new compact family. 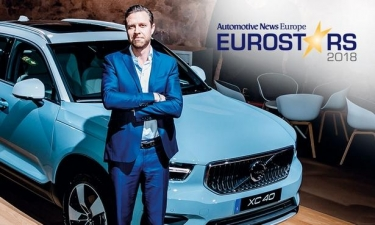 REASON FOR WINNINGPetrofski's work on the XC40 is a key reason why the compact SUV became the first Volvo to win the European Car of the Year in the award's 55-year history. The victory, which was announced in March, was followed by news in May that Volvo would expand XC40 output in Belgium and start production of the compact SUV in China next year after receiving nearly 80,000 orders. Volvo says the XC40 has surpassed the company's most optimistic expectations.